Detailed Itinerary: Upon arrival at Beijing airport, be picked up by our private guide, who will wait at the exit of the airport by holding a sign with your name on. Drive to Badaling Great Wall (1.5 hours). Badaling section is the most visited one among all the Great Wall sections. You will hike for 2 hours on the Badaling Great Wall, up snaking sections of walls, entering the watchtowers and seeing distant views. 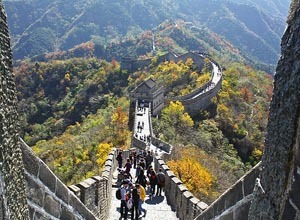 Then head for the Mutianyu Great Wall which is famous for its beautiful surroundings. You have about 2 hours to hike on it. Cable car up or toboggan down is optional. Back to airport after the great wall hiking tour. 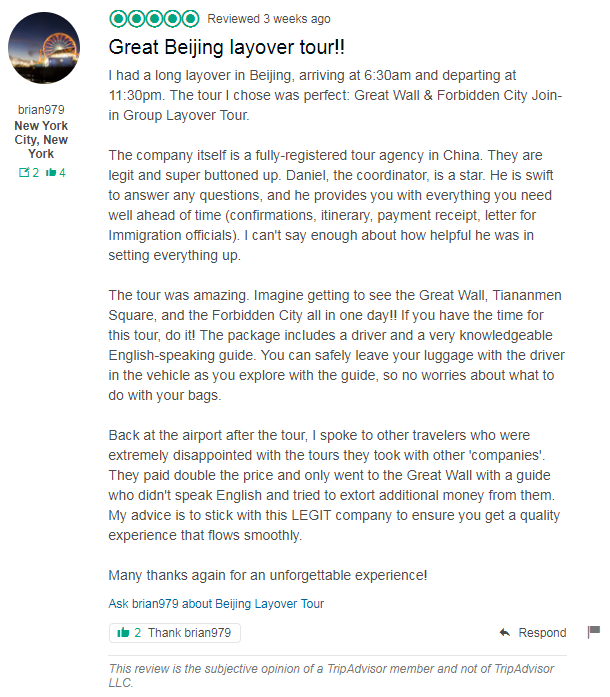 Sorry, no, we do not have group tour to Badaling Great Wall and Mutianyu Great Wall. And according to your arrival time, your time only enough to visit one section. Hi, oh ok. I do have a day and a half though. I was looking at doing the tour on the 8/1/18. So my option is to do a pricate tour pickup from airport and drop off back at airport? Could you tell me how much time will typically be spent at each of the two sections? We can arrange this tour for you on Jan. 8, 2018. You will have about 3 hours at each section. And we can pick you up from your hotel instead of airport. We have sent you an email about detailed tour itinerary with the timeline, please check. i want to book the tour with Badaling and Mutianyu Great wall is it possible to stop also at the Ming Tomb? my second question if i book two different tours do i got a discount? Please provide us your flight times and dates. Then we will make a detailed itinerary and give you a best price. How much is the Badaling Great Wall & Mutianyu Great Wall Layover Tour for 3 people? We will be arriving there on January 2nd at 5:30am and our departure time is the same day at 8:30pm. Thank you for your message. Our travel advisor just sent an email to you, please check it out and let us know your idea. We just sent you an email about your questions, please check. Thank you!